In this tutorial we'll help you get started with your first campaign! To get you up and running as quickly as possible, we will only focus on the essential steps in this tutorial. You can find more detailed information about advanced features in these tutorials: Advanced Features. 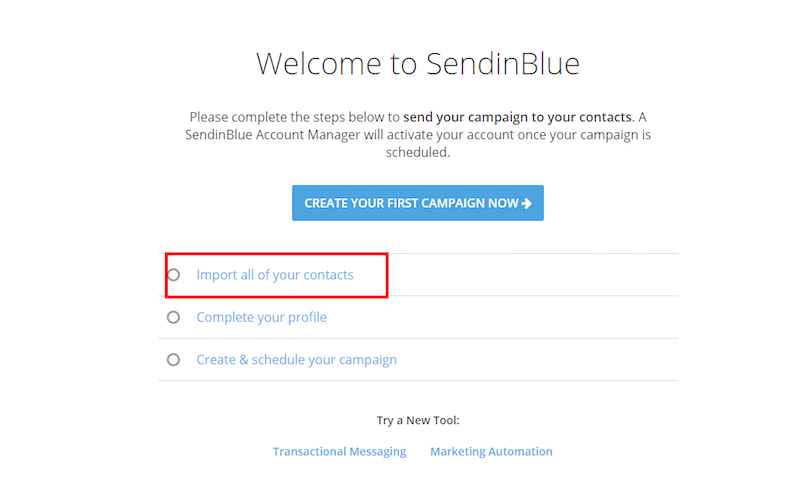 After creating a SendinBlue account, you'll need to complete 3 steps to validate your account. Click on the "Import all of your contacts" option as shown below. You can import your subscribers from .txt, or .csv files, add manually, or copy/paste your contacts. To properly import data containing special characters, please ensure your files are saved as a CSV (comma delimited) or (comma separated values) file with the extension: .csv. Learn more about importing your contact file(s) by clicking here. A single contacts folder may contain multiple contact lists. A contact list is a database of your subscribers' contact information and other personal information that they have shared with you (e.g. Name, Last Name, Telephone, etc.). If you wish to create new folders to organize and segment your list, head to the "Lists" section. Then, click on the drop-down menu and select "Create a new folder". To create a list, click on the blue button for "Add a new list". You will be taken to the page below. If you have not already confirmed your email address, you will see a reminder highlighted in blue at the top of the page. Please check your email and click on the confirmation link or follow the prompts to resend the confirmation email. Please enter correct information in all fields, including a valid mobile number. We will send you a text message with a verification code to finalize your profile. 3. Now you're ready to create your campaign! Before you begin creating your first campaign, we suggest watching this quick video tutorial on how to use the Drag & Drop Editor to create your first campaign. Now, let's go to the Campaigns Tab and choose Email in the left navigation. Ensure you are on the Campaigns tab and then click the green Create an email campaign button. Campaign name: Give your campaign a name; it will only be visible to you and is only used for organizing your campaigns. It will not be visible to your recipients. Subject: The subject line is one of the most important email settings. A good subject line will positively impact your open rates and deliverability (avoiding spam). Choose a subject that clearly describes your email content. From name: The 'From Name' appears in your recipient's inbox to identify you as the message sender. Its purpose is to build trust with recipients and generate more openings. The default value is the company name provided in your SendinBlue profile [DEFAULT_FROM_NAME]. To change the Default From Name, go to the Settings tab inside Campaigns and modify it in Default Settings. Sender email: Helps your recipients recognize you as the message sender, so it is just as important as the "From name". The default value is your account email address. Don't forget that you can change the sender email by updating it in this field. Note: Your profile must be completed to send or schedule your campaign. Drag & Drop Editor: Create a mobile-friendly (responsive) email by dragging and dropping text blocks, images, buttons and other design elements to create a beautiful email. 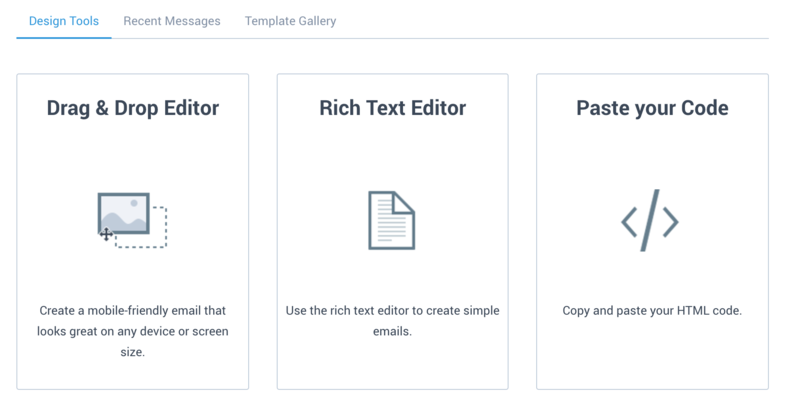 Rich Text Editor: Create simple text emails using a WYSIWYG (What-you-see-is-what-you-get) editor. Paste Your Code: Paste your own HTML code, which should be created by a design professional. Once you have saved and exited the campaign builder, you can preview your email campaign and send test emails. Now you can choose which contacts will receive your email. You can also add search filters (ex: new customers, etc.) or exclusion lists to further target your audience. In order to validate your account, you must select more than 10 contacts. Congratulations, you have successfully completed all the steps to send your first campaign and for validating your account! Learn more about our validation process here. After your account is validated, your campaign will be saved as a draft and you will need to reschedule it to send. Return to your Campaigns Dashboard, locate your campaign in Drafts and click the Edit button to select a new send time. Once your campaign has been sent, you can monitor your results by visiting your Dashboard or Statistics Tab. To learn more about the campaign stats and reports, click here. Please send us an email (contact@sendinblue.com) if you have any questions or challenges with the steps in this tutorial. Tip: Take a look at our Advanced Features to learn how to make the most of your marketing!